A dry spell in August means haymaking. The cut fields smell of my childhood, and the tractors thunder through the Square to pick up the bales before the rains come. This week, Mr Grigg has been victorious, picking up a medal in the battle for the Crosby Plate, a major cricket competition around these parts. Here he is at the presentation with his team mates. But you'll have to guess which one he is. The team should get a mention on Radio 4 on August 25 - my birthday - when human rights lawyer Clive Stafford Smith presents With Great Pleasure. This is a Desert Island Discs-style programme with guests presenters and literature at its heart. I know this because on Monday, the ever-resourceful Pelly managed to get us tickets for two recordings of the show at The Electric Palace in Bridport. This is an old cinema that has risen phoenix-like from the dust of years of closure to become one of the best and most diverse entertainment venues around. I feared an intense, highbrow performance from Stafford Smith, who for 25 years has been representing prisoners facing the death penalty. He is a very clever man. But he strolled on to the stage in cricket whites, and with self-deprecating humour apologised for his appearance. He explained he was hoping to catch the last minutes of a cricket final in a nearby village. He was playing for the Mapperton Marauders. I gave a big whoop. 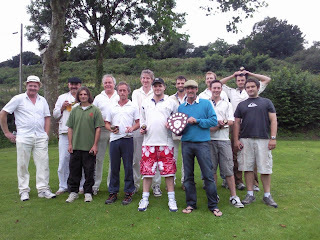 This is Mr Grigg's team and he was its founding captain 10 years ago. Listen in at 11.30am when the show is broadcast. You may just hear me whooping. Stafford Smith's choice of prose and poetry was highly accessible. It made perfect sense when he confided that as a child, the mythical character with whom he most identified was Robin Hood. A fearless campaigner for social justice, he is the founder and director of Reprieve, which uses the law to enforce the human rights of prisoners from death row to Guantánamo Bay. One of the most poignant pieces he chose was a statement by a right wing US judge who at the eleventh hour of his professional life suddenly wandered down a humanitarian path. Then it was the turn of Fay Weldon, who toddled on to the stage in black top and velvet trousers and a magnificent technicolour dreamcoat jacket. Despite her advancing years and constant putting on and removing large glasses at the microphone, she was as sharp as Mr Grigg's penknife. In a sweet, posh voice, she told the audience this was a Radio 4 first as her interview with Roy Plumley for Desert Island Discs was never broadcast. Hers was indeed a more highbrow choice, with a Thomas Hardy poem thrown in for the Dorset audience. At the end of the show, we ambled up to the town hall where an army of Mapperton Marauders were outside a pub, celebrating their win with cider and roll-ups. Back home, Mr Grigg would be in good spirits and the diet forgotten, so Mrs Bancroft, Number One Son and I went to the chip shop to pick up some supper. As we waited for our haddock to cook, who should stroll in for a piece of fish but Fay Weldon, her naughty eyes a glinting. The old she-devil. You've certainly captured the moment Maddie. That's a smashing photo of the cricket team. All the usual suspects. Hmmmmmmmm - must look down that list on your sidebar to see if I can match some names and faces. Lovely catching up with the news dearie, I guess Mr Griggs is the handsome suave one with the washboard stomach ? Diets go out of the window when medals have been won, congratulations Mr Grigg. Great photo of the Maruaders I'd recognise those chubby cheeks anywhere! You lucky thing - all sounds great fun and would love to hear Fay Weldon. Sometimes I think she's crackers but she is always interesting and good value. And I have a weakness for men in cricket whites. Well done the Mapperton M's & of course Mr Grigg especially. Get you hobnobbing with the famous will we need to tug forelocks before entering your blog?! Really good and a great fun read Maddie.